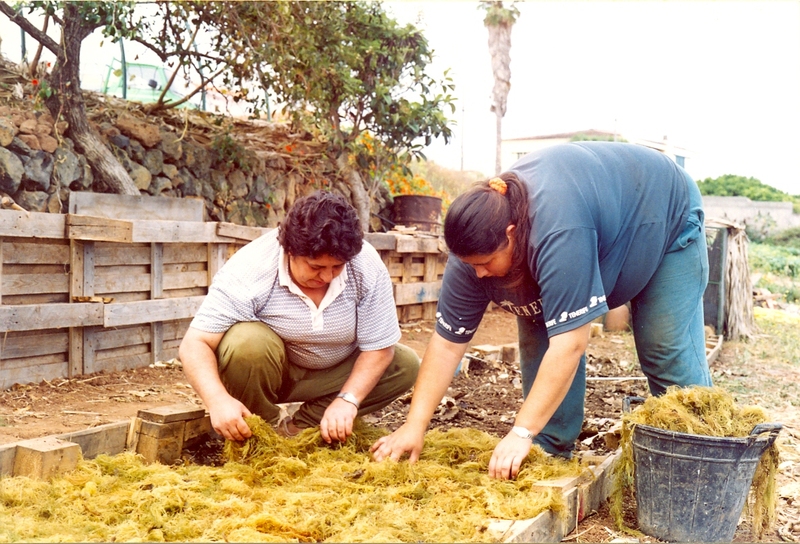 The Association for the Development of Permaculture (ADP) is a non-profit body created in Tacoronte, Tenerife, Spain in 2001. It was declared of public utility at state level in March 2011, Good Practice of the United Nations Human Settlements Programme (UN – HABITAT) in 2012 and of public interest of the Canary Islands in January 2018. 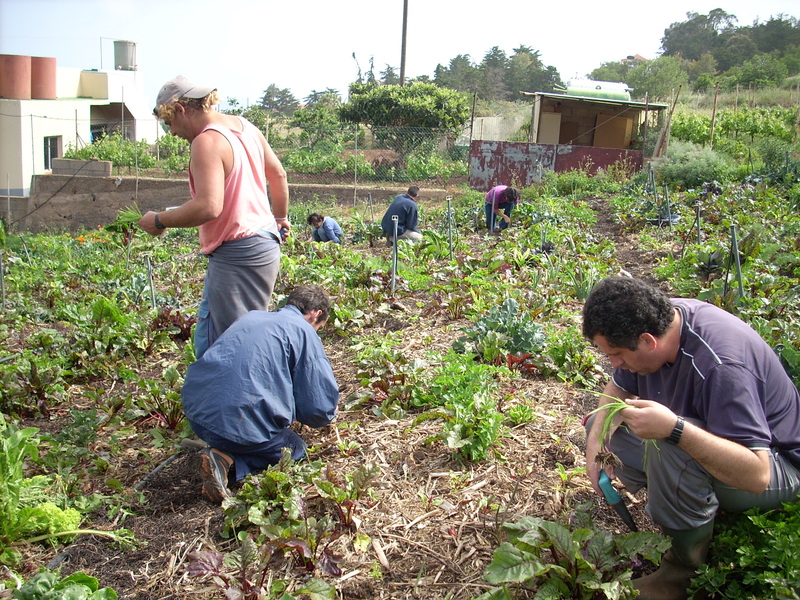 Its main programme objectives are spreading permaculture principles, along with the social integration and employability of persons suffering from mental illness, biodiversity of plants and animals and the participation in social volunteering. During 11 years one of the main projects was the Special Employment Centre (2002-2013). 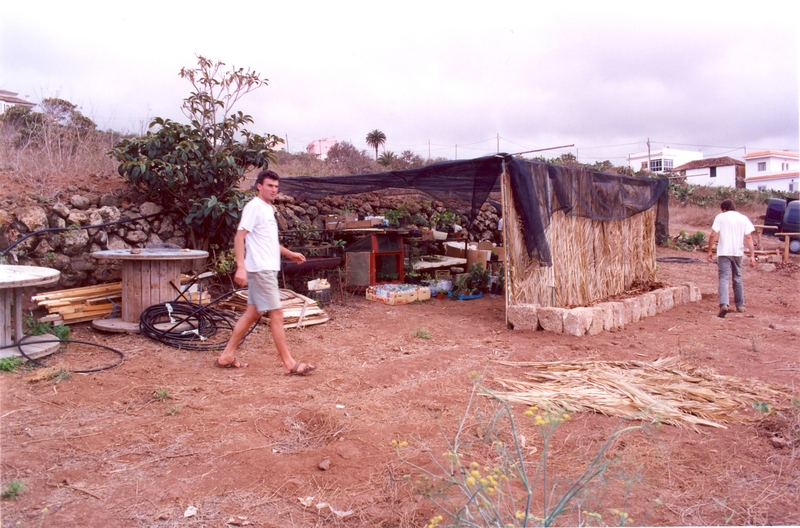 Finca El Mato Tinto –headquarter of ADP– started its permacultural path in 1996 as of a permaculture course held in the island. The course was the toolkit that channelled the concerns of the driving force behind the project. In fact, after travelling around the world in search of a life project in line with nature, the developer of the project found the solution in a permacultural mindset, even though he was not aware of it prior to the course. 22 years later the center is an open learning center based on the trial-and-error method. 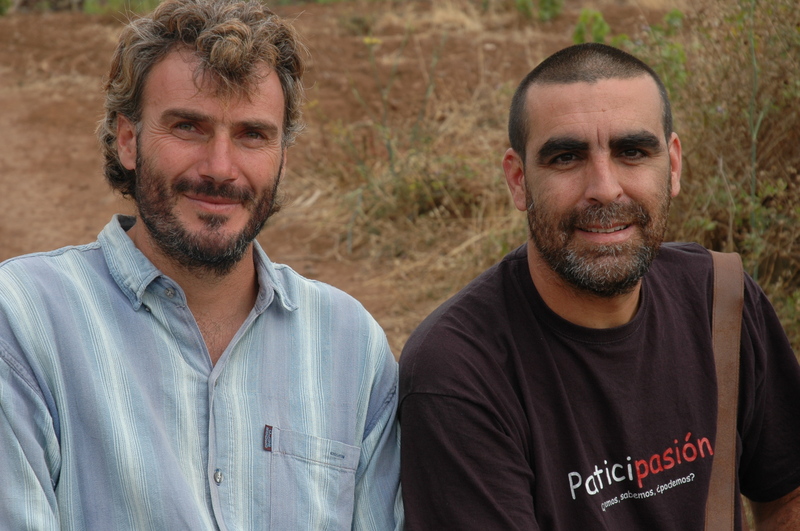 The PERMIND guide has become a great opportunity to standardize this experience and to keep progressing together with the project partners and in line with the ADP objective to spread the permaculture principles. 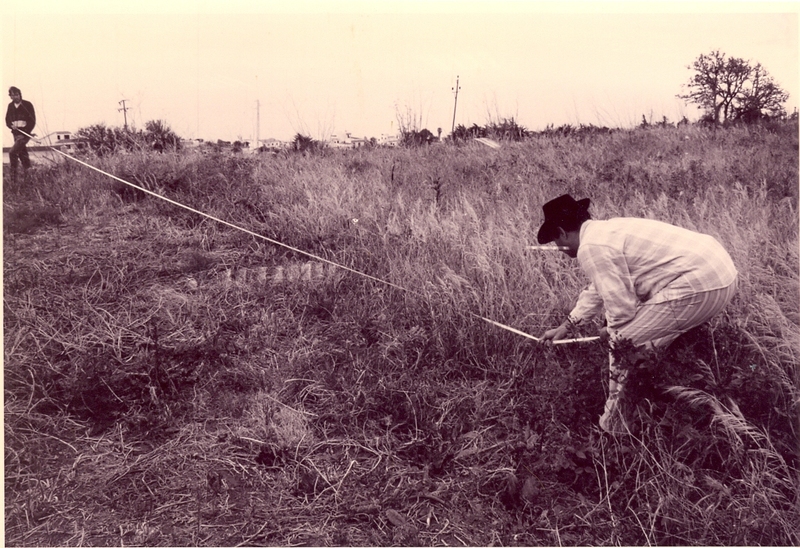 The idea of creating the ADP originated at the end of the course, when a terrain of one hectare was available: El Mato Tinto farm (Figure 1.1). A farm of 10.000 square meters that has been applying permaculture principles since 1996 and that turned into the nerve centre of a practice based on natural patterns. Through accurate observation and reflection, the environment becomes sustainable and its benefits are reinvested into the community as a way to recover the lost symbiotic relationship between city and countryside, as described by the Aristotelian principles of equilibrium, limit and oikos. An experience that not only reaches the 10.000 m2 of its nerve centre: its influence exceeds these limits thanks to the network created during the last 22 years. 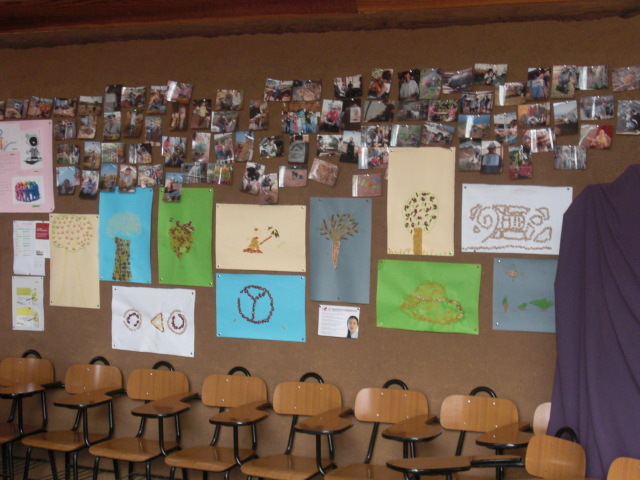 This network is composed by associations of families and persons suffering from mental illness; companies and neighbours of the area providing us with waste that we convert into resources; volunteers collaborating with their work in exchange of training; the public administration on a regional, insular and local level; educational institutions; families that purchase ecological products from the farm every week. They are therefore linking the agro-food sector with the local economic development and involving the citizens in the philosophy of the project. A net that we will be able to present in the permacultural activities described in the following didactic units of this guide. The project grew out of a previous permacultural design where workshops are integrated along with animals that serve as therapy, edible gardens and garden forests, bioconstruction, renewable energy, seed management, creation of natural treatment plant for water management, local organic resources networks… And by doing so, not only create a close relationship in therapy, but also to get a healthier diet through the cultivation of soil and water. 22 years of training thanks to the trial-and-error method. Since the very first moment the main therapeutic project has been the building of the center itself (Figure 1.2). The Special Employment Center (CEE in Spanish) was established in 2002. The trust of its developer, the availability of a farm that had been cultivated with permaculture principles for 6 years and the venture to start a project as a way of life were key to outweigh the initial obstacles of a family and a community that was resistant to a misunderstood project, and the reluctance of the embryonic ADP-group to include a social grant-based project involving permaculture as a form of therapy in 1996. These same obstacles turned into opportunities for the developer, especially the strength created by the social project that involved people facing a double rejection: of their illness and of society. 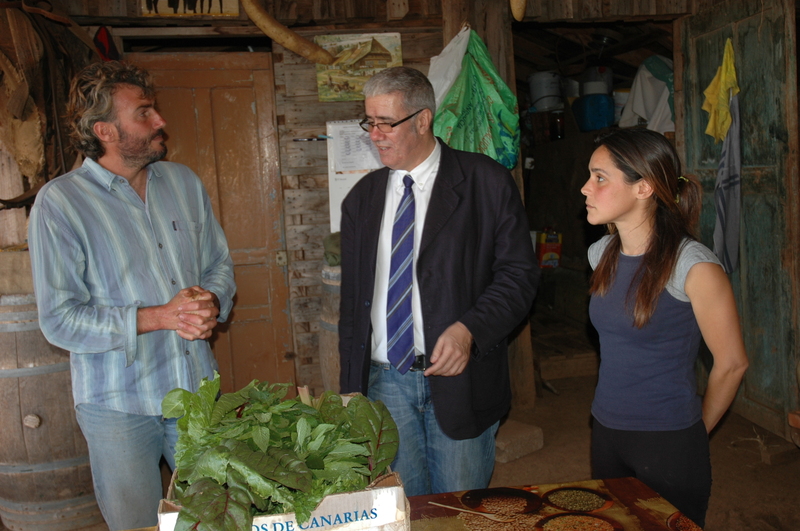 Such determination made the promoter search resources for mental health and meet the Insular Council of Psychosocial Rehabilitation and Community Action (CIRPAC in Spanish), institution created by the Canary Islands government and subscribed to the Health Council for community services and psychiatric recovery. In a context marked by a lack of mental health resources, CIRPAC encouraged the developer to create a Special Employment Center benefiting from the European project Equal, which promotes entrepreneurship in order to address disability (Figure 1.3). The CEE was created with a previous and successful business background of the promoter —the promoter dropped a previous company for this initiative—, with resources from CIRPAC and grants from the Employment Service of the Canary Islands of 50% of the official minimum wage for workers suffering from mental illness and the complete social security contributions from Social Security. When its developer learned about mental illness with the CEE workers, the center turned out to be an opportunity for a shared education between the developer and its users: for him it provided a higher capacity to face challenges and to the users a higher self-esteem. The CEE adopted the permacultural design principles as a method. Natural, personal and institutional patterns play a crucial role in this methodology, resulting in an infrastructure that is able to train and integrate every socially stigmatized group. 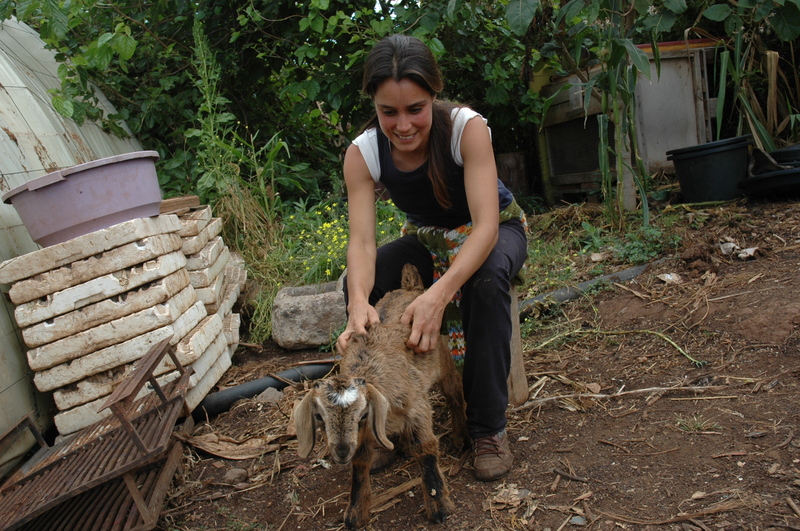 The sustainability of the project is inherent to the commitment of identifying permaculture as a way of life, as a project of cooperation and of therapy. We are talking about a social company which staffs consist of a minimum of 70% of people with mental problems. Such a commitment reveals its social dimension (Figure 1.4). 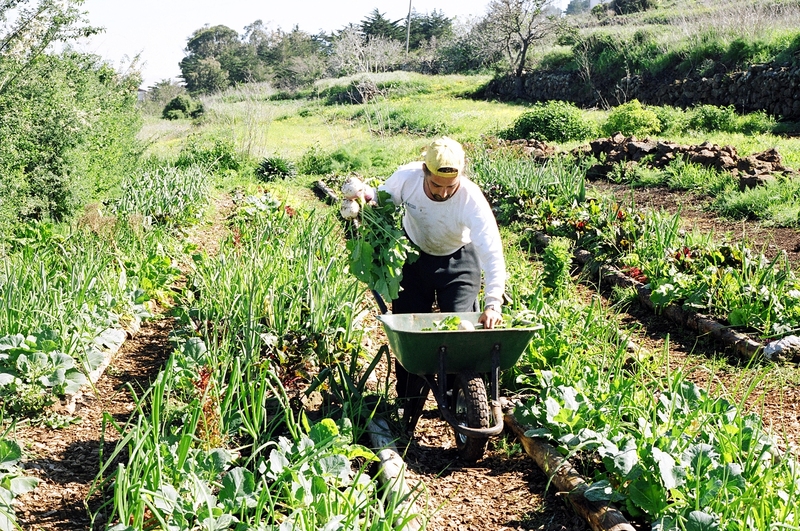 Cultural and environmental aspects are addressed from the very conception of permaculture: a holistic system that seeks to sustainably manage the resources for a mutual benefit of both humankind and nature. All of this is based on the principles of taking care of the land, its people and sharing its resources. “Taking care of people” brings the initiative to the institutional framework, specifically CIRPAC, –institution that provides the mental health resources map in the Canary Islands, and therefore to the legislative framework, social policies, sector strategies and other useful proceedings for its implementation and functioning. 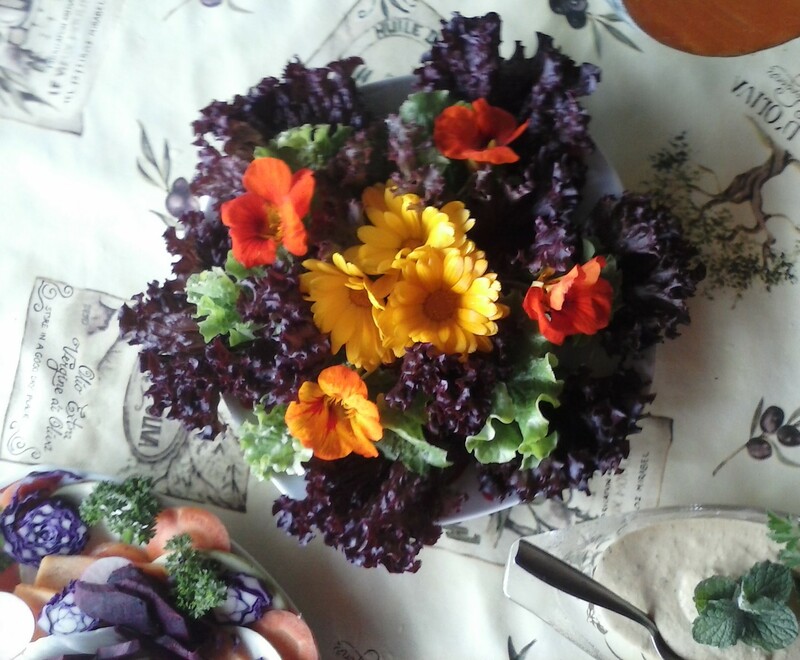 From the point of view of the transferability of the CEE, two levels can be distinguished: permaculture as a way of life and permaculture as therapy. These two levels are of course connected to each other. 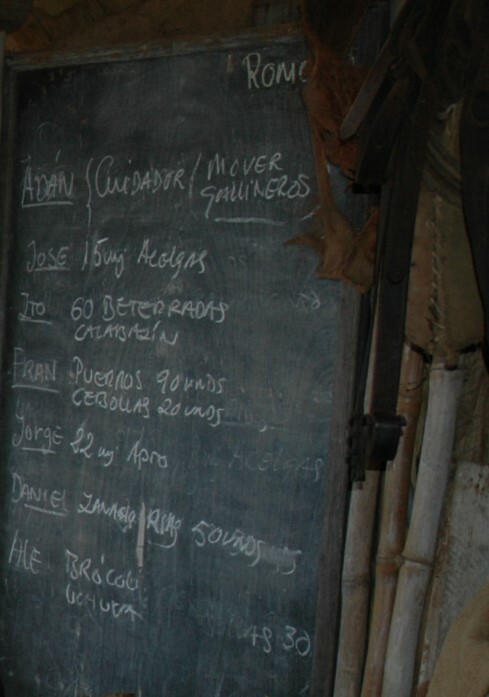 There are many transferability cases of the first level that are learned through various courses in the Finca El Mato Tinto. We have echoed about those in the PERMIND guide introduction, which experience is spread and applied by the students within various personal and institutional frameworks. Regarding the second level, there was a first one-year-long exercise of replicating in 2011 with the presence of an occupational center of the association Afes Salud Mental in the Finca El Mato Tinto through an agreement with the ADP. Such experience arose from an employment integration course for people suffering from mental illness that was organised by Afes in the farm a year earlier. 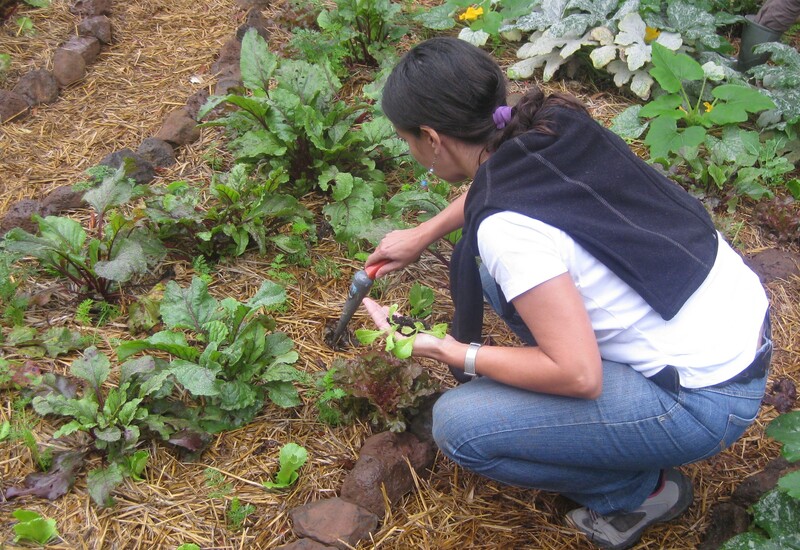 In this course, the permaculture principles were used, just as they are applied in the farm. 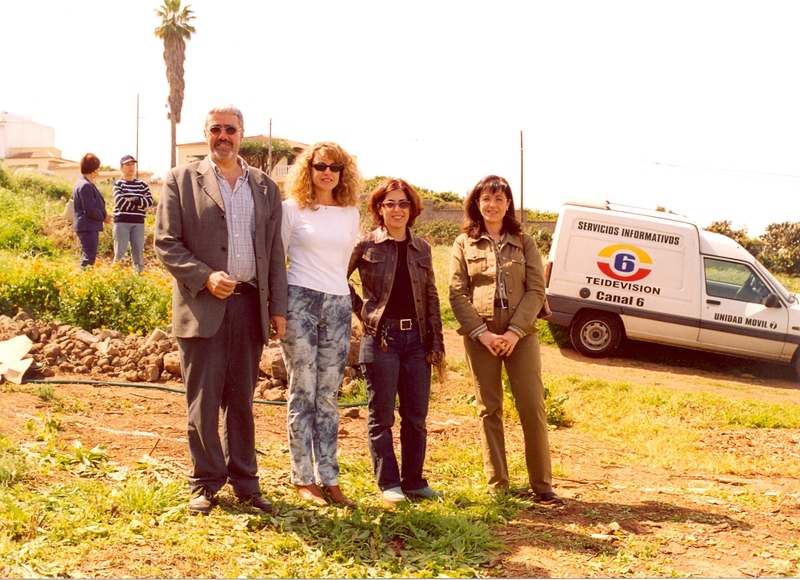 The responsible persons of Afes designed the agreement after having noticed the positive effects of permaculture in the rehabilitation of persons suffering from mental illness working in the Special Employment Center. In fact, when the integration course was finished, some of the students of the course did an internship in the CEE and became staff. During this period (October 2011 – October 2012) there were several moments when CEE employees and students from the Occupational Center were working together and supported each other (Figure 1.5). Later in 2014, another transferability experience with the Insular Institute of Social and Socio-Health Care of Tenerife (IASS in Spanish) took place involving the LASOS project, which we will explain later in this unit. Persons with mental health problems derived from mental health units, day centers, residences, supervised flats, directly from families and social affairs services of different city councils in the island. They were added to both the CEE and the ADP. As we mentioned before, there were also many agreements with occupational centers that work with social groups and that develop permacultural activities in the center. Also a group of volunteers from the islands and abroad collaborated in the center and were part of the mutual integration progress of any social group in the project. 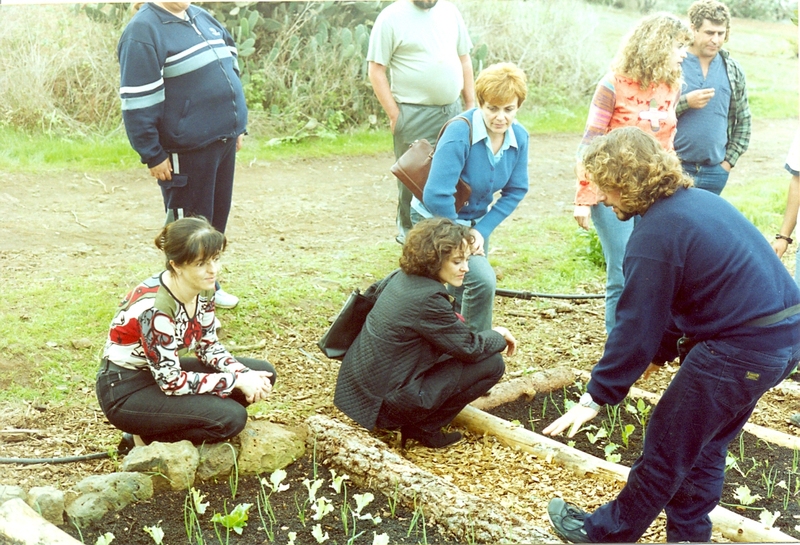 The objectives that were targeted using this form of therapy include training and integrating persons with mental illness using the contact with nature and the permaculture philosophy in order to provide enough tools so they can join the labour market afterwards. The result of this therapy is a basic training, but still complete due to the various labour sectors it covers, which results in more job opportunities. Thanks to the mental health resources, a selection among the various pre-labour workshops –which develop skills in agriculture, farming, carpentry, construction, recycling– is made so the pupils join the one that fits best according to their profile (Figure 1.6). • Improvement of social and job performance by developing social skills that allows a correct communication with colleagues. • Learning and maintenance of basic work habits (punctuality, compliance with the established working schedule, learn to respect the rules –both explicit and implicit that may have an impact on the coexistence and functioning in the work place, better perseverance in the tasks). • Improvement of teamwork, being able to ask for help and to work with their colleagues. • Improvement of basic cognitive skills such as attention, concentration, understanding and following instructions. • Improvement of the development of the daily chores (better personal care, use of transports, care of the environment…). Among the suitable processes needed to ensure the sustainability of the project, there is the financial one: the CEE initiative emerged from the support of the Equal project and the Employment Service of the Canary Islands. This resulted in beginning in 2002 with a ratio of 81% of external resources (subsidies) and 19% of own resources (agricultural production sales). By 2010 the situation was reversed: 32% of external resources and 68% of own resources. 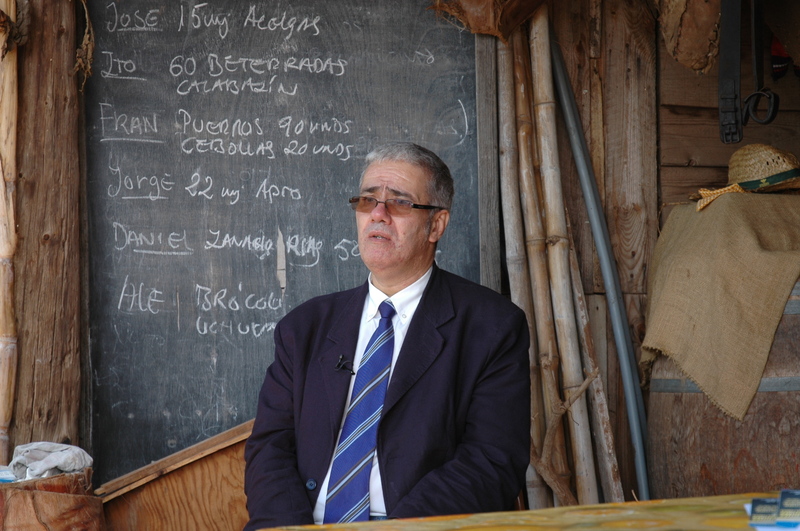 With the economic crisis of 2007, the ratios suffered due to prolonged delays of the subsidies of 50% of the salaries that the Employment Service of the Canary Islands had to provide. The delays were assumed by the CEE, which endangered the ADP objectives. This situation was valued by the ADP and the decision to close the CEE was made, without losing the therapeutic dimension of permaculture. Since 2013, the ADP dedicated itself to other training formats as we described in the Introduction. The Association always had and still has the same therapy principles as those used in the CEE. 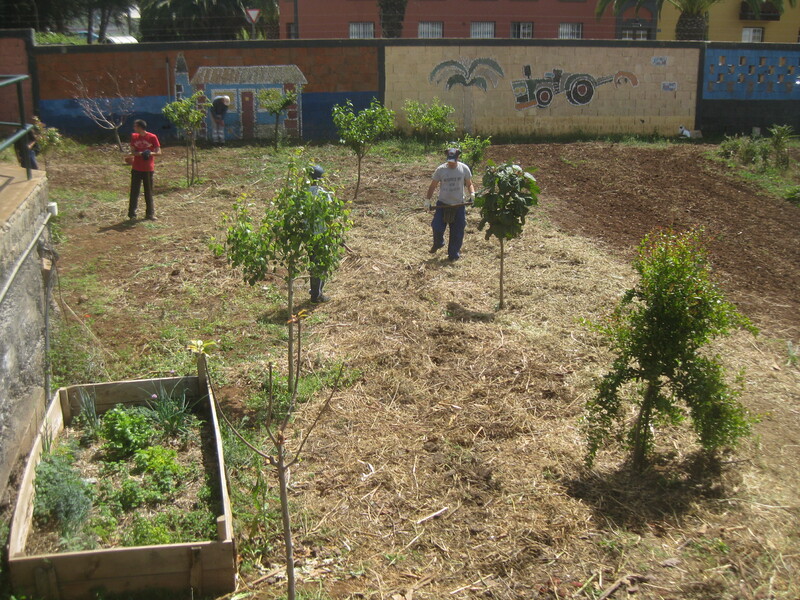 As a confirmation of the role of permaculture as a recovery experience we transcribe several impressions of various persons that took part in the Special Employment Center or that were students and volunteers in the ADP experience (Figure 1.7). In a certain way, this transcription exercise could evoke the role of the focus groups foreseen in the evaluation of the PERMIND pilot experiences implemented from this guide. Since 2013 until the moment of finishing the first edition of the PERMIND guide (March 2018), this therapeutic dimension, combined with the volunteering and occasional collaborations with mental health associations is still addressed. However, the 11-year long, rich experience of the CEE regains momentum thanks to the transfer of knowledge and replicability given by the Erasmus+ PERMIND project for the Training of Adult Persons through the implementation of various pilot projects, following the guidelines of this guide. The PERMIND project is inspired by the CEE therapeutic experience and wants to research if this success could be applied under different conditions or backgrounds at a European level or if it was just a temporary, positive experience made possible by other factors. Permacultural and metaphorically speaking the PERMIND project represents the opportunity for cultivating healthy human relationships through the “therapeutic organic matter” that this guide represents; an “organic matter” that we “water” during the Training Course for PERMIND Trainers; “we sow, plant and harvest its fruits” during the PERMIND pilot projects and at the end of the project we “recollect its seeds” in order to keep on cultivating healthy human relationships in the future. We also talk about an innovative proposal of PERMIND in the field of improving working methodology, taking into consideration the personal needs and not only the technical knowledge, emphasizing the cross-sectional competencies for participation and social integration, employability and also learning as an active face of proposal itself through the creation and development approach. For this reason the CEE Finca El Mato Permacultura therapeutic experience is not just a historic exercise but also an opportunity for the present and the future. 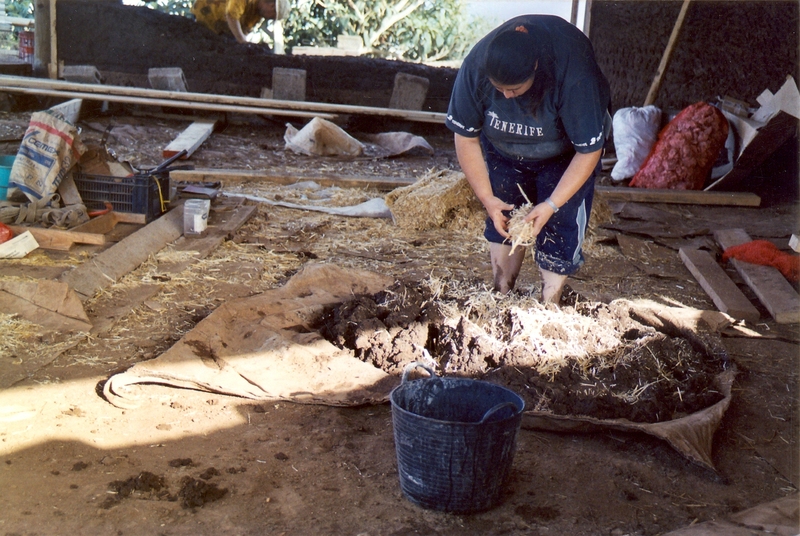 The transferability of the CEE therapeutic experience to this guide is raised at two levels: a) describing two therapeutic experiences out of the CEE record we still utilize – permaculture in the kitchen and animated permaculture; b) transferring the therapeutic information from the CEE permaculture experience to the various permacultural design and care activities described in the following didactic units of this guide. 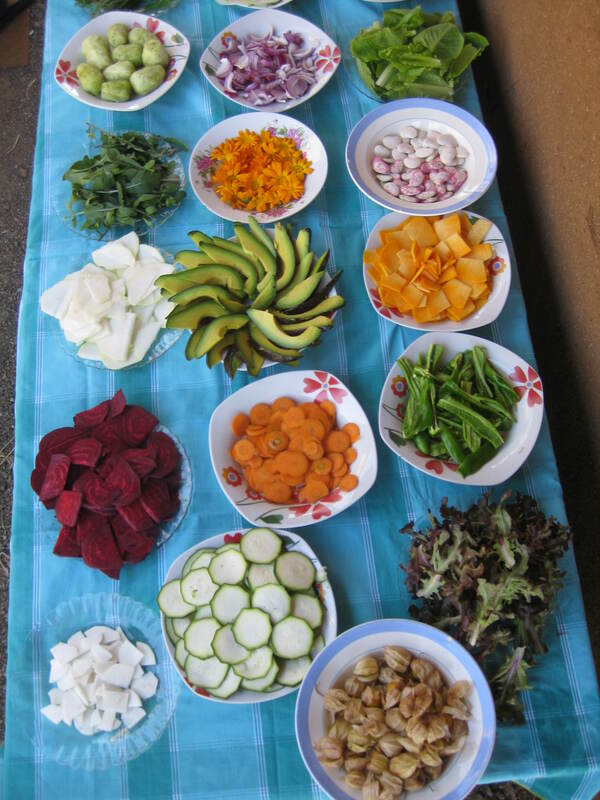 With permaculture in the kitchen we seek to reinforce the daily basic activities and raise awareness about gender equality among the students of our therapy centers. They prepare simple dishes, wash vegetables, learn how to prepare a coffee, a tea, toasts, boil an egg, etc… They learn how to organize themselves in different chores such as cleaning and tidying up, they gain responsibly by doing the dishes with less soap and water and keep both the kitchen and the dining room clean and tidy. In our case we entrust this task to one or two pupils, depending of their autonomy, this person is called The Caretaker! 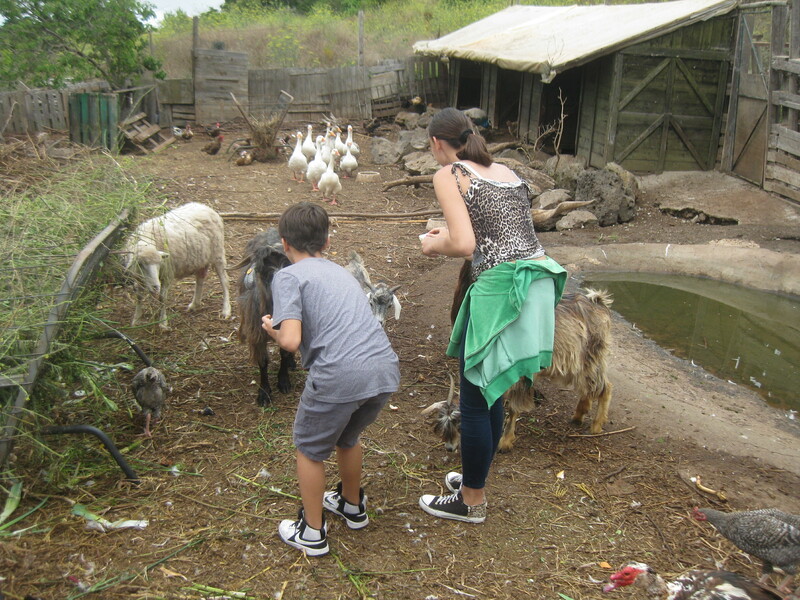 During one week, this or these caretakers are responsible for taking care of the animals in the farm –feeding them and satisfying their needs– and also taking care of their colleagues –preparing breakfast with the products from the edible gardens and garden forests. 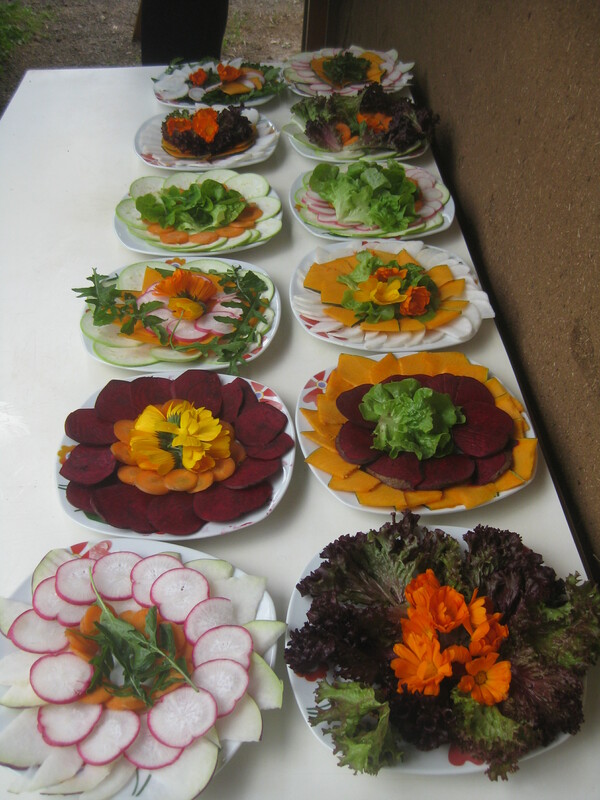 Here, the monitors help the students in order to develop the creativity in the kitchen, by making colourful salads with our vegetables, fruits and edible flowers (Figure 1.8). 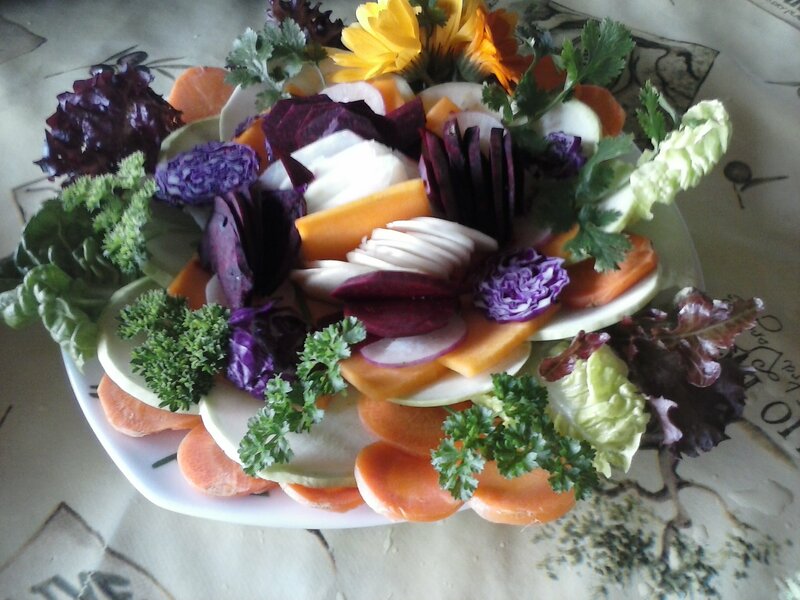 We also help them to eat raw vegetables that don’t need to be cooked, such as pumpkins, zucchini, leek, broccoli, cauliflower… developing our senses in tastings and decorating dishes in the most tempting colours and flavours (Figure 1.9). 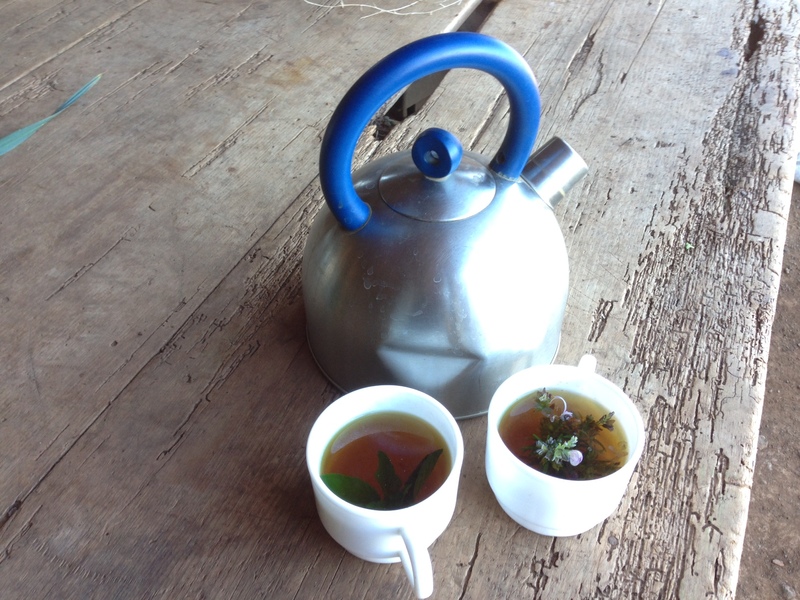 The herbal infusions are made with aromatic herbs from our edible gardens and garden forests. 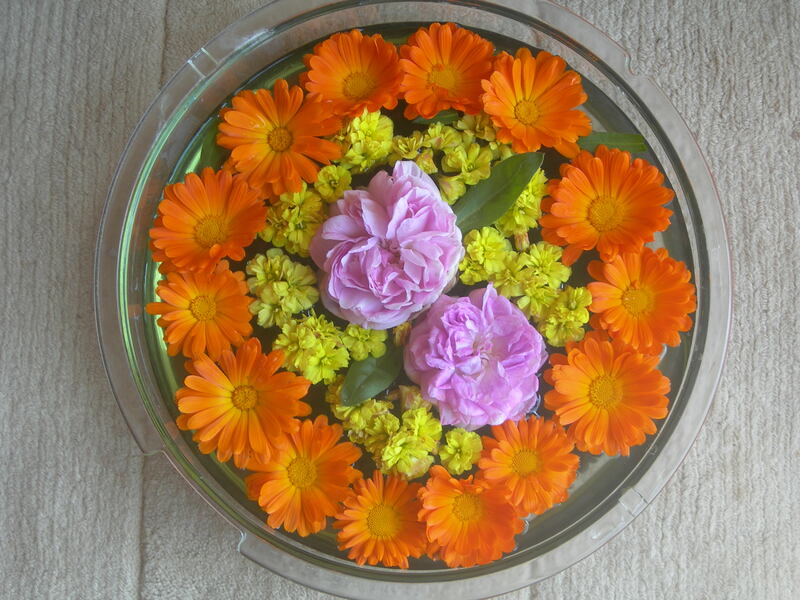 Each week, the caretaker chooses two plants for the infusion so he can memorize them and learn the different health benefits of each plant over time (Figure 1.10). 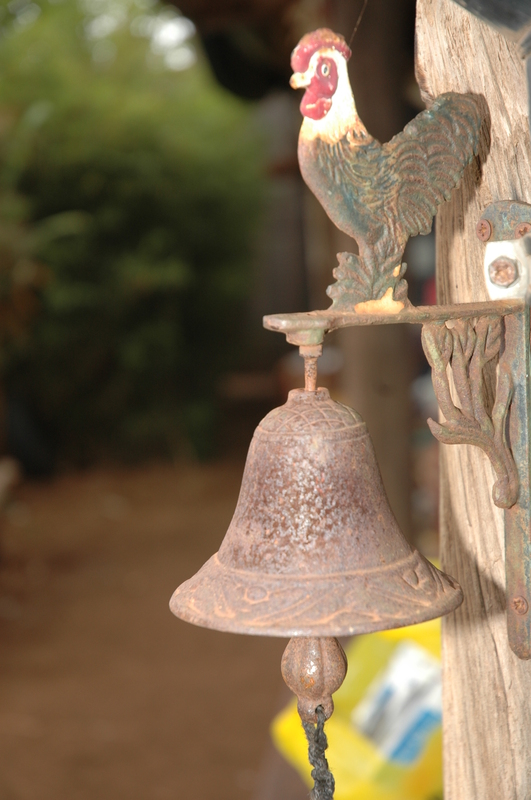 Once the caretaker prepared the breakfast, he rings the bell to let everyone know that they can sit down and gather around the table to eat (Figure 1.11). This collective moment is a time of sharing, unloading, joking, laughing… In short, a time to create a sense of family, creating healthy environments and cultivating people. 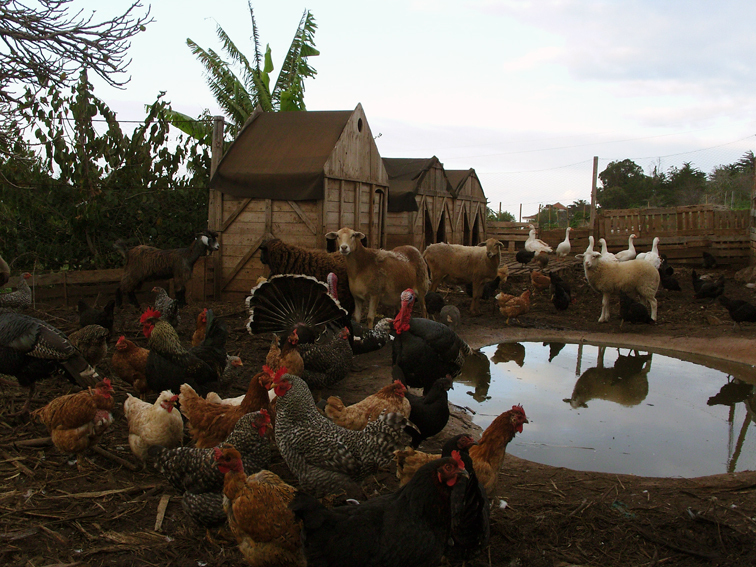 Animated permaculture –permaculture with animals– is highly important for the bonds that are made between the students and the animals when they are doing care and maintenance chores, because then they are closest to them. This relationship with animals helps them to open up more, to lose fears, to make them more aware of the present moment, here and now, creating a feeling of wellbeing that they end up transferring to their colleagues. In this context we can notice relevant and important changes in their relationship with the others because they are sharing the experience with everyone. Hence the therapeutic importance of having different species of animals coexisting all together: it is a real source of inspiration for the students (Figure 1.12). We talk about activities that result in opportunities to promote the observation and retentive memory. In these activities we use the concept of a cycle. To observe and breathe what our natural surroundings tell us. Cultivating observation is an opportunity to reflect about the changes we need to make in order to achieve a good mental health. 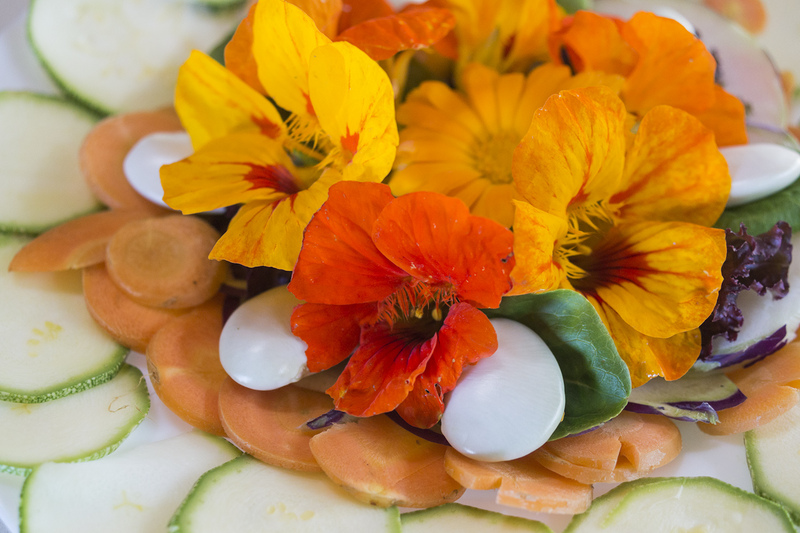 We cultivate observation, attention and the initiative to take care and protect our edible gardens and garden forests while observing the lifecycle, the biodiversity of plants and seed varieties we have in our vegetable gardens. 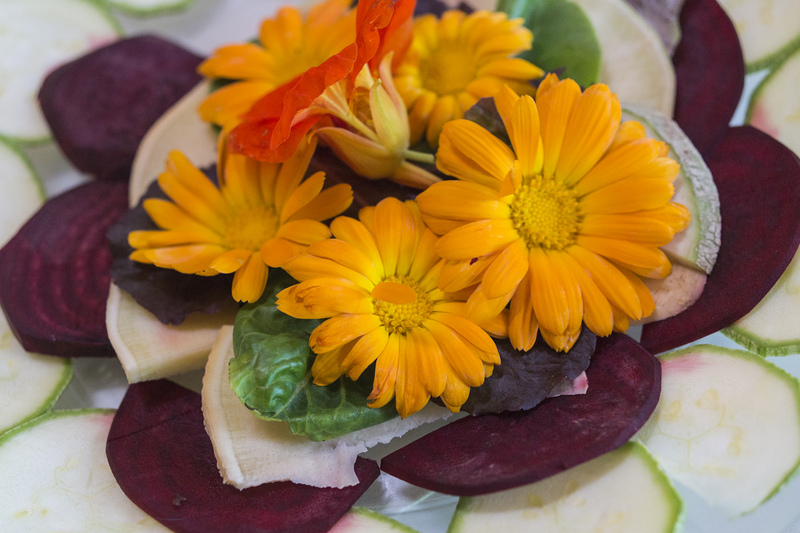 For instance, we organize an exhibition of the many vegetable samples from our gardens in various evolution stages. We talk about enjoying and learning through observation of the plants and the evolution of its flowers, from the moment we sow them, until they sprout, grow flowers and fruits and wilt and produce mature seeds. We encourage the students to observe the curious and magic design nature uses to get the seeds transported by wind and animals. 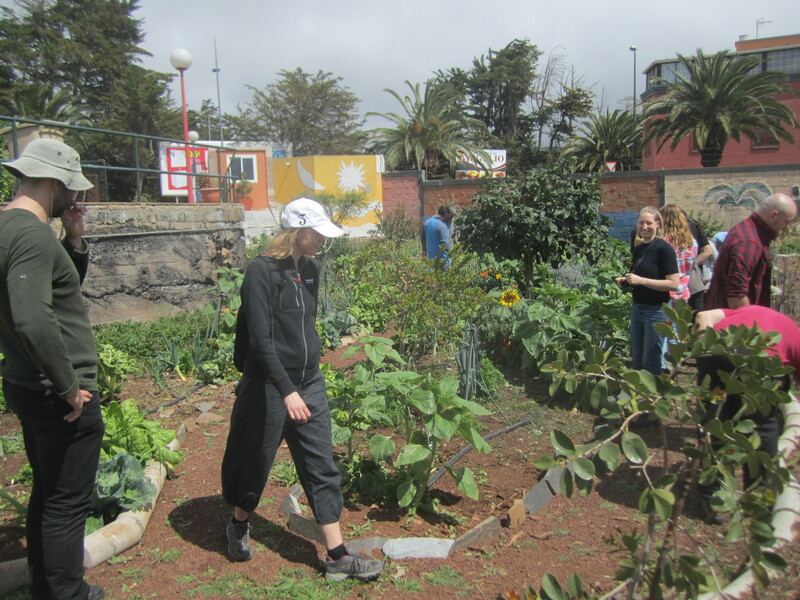 We emphasize the importance to regularly visit the edible gardens with a group of students for maintenance tasks such as removing seedlings of unwanted plants. 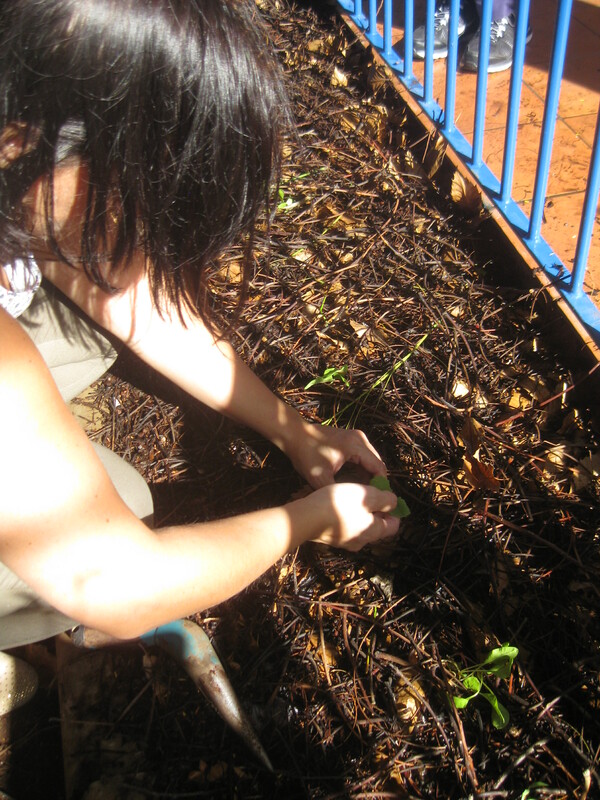 By doing so, the students will learn to distinguish and identify the seedlings of adventitious plants. We use tools such as a fish tank to visualize the soil so pupils can understand the different layers and functioning of a living soil. That means dedicating time to observe the beauty of our plants and to take a walk along the paths of life in our edible gardens. The moment when the seeds germinate is a very special moment for the persons that have participated in the sowing, since they can enjoy the view of the edible creativity they have made possible. It is important to identify interesting places where our users can observe and learn the various roles these places play. 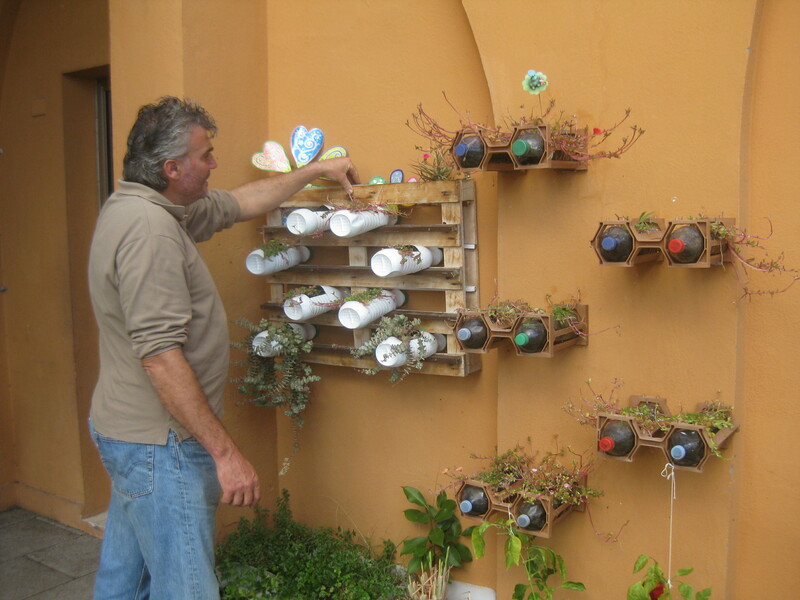 They can for example observe how during the rainy seasons the rainwater flows into the swales in the edible gardens and listen how it drops into the pond or how in a dry season the affluent of the natural treatment plant becomes a permanent pond. We talk about shared learning, mutual help, job satisfaction, promotion of concentration, attention, relationships and social skills of all the students. We show the seeds germination tests as an example of a funny and educational activity: a unique opportunity for the students to reason and learn about photosynthesis, the nature’s productive process by excellence. We trigger a feeling of intrigue for the future germination of the seeds they have sown, making them impatient and interested to monitor the sowing. We encourage them to see the difference between the seedlings of weeds and the ones of vegetables. 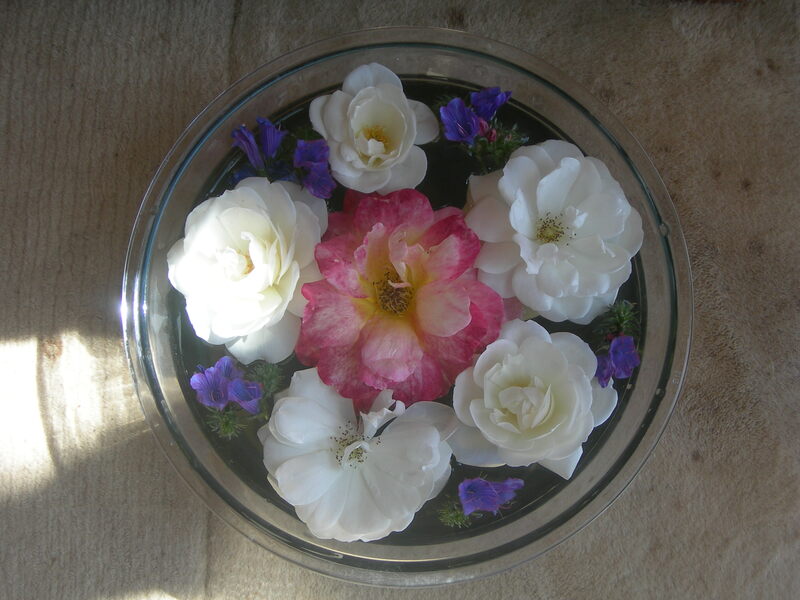 The students feel fulfilled and pleased when they observe what they have created, there is a feeling of well-being. We emphasize the feeling to belong somewhere with the role of the guided visits to the farm (Figure 1.13) and with the foot and hand therapies in the bioconstruction workshops. 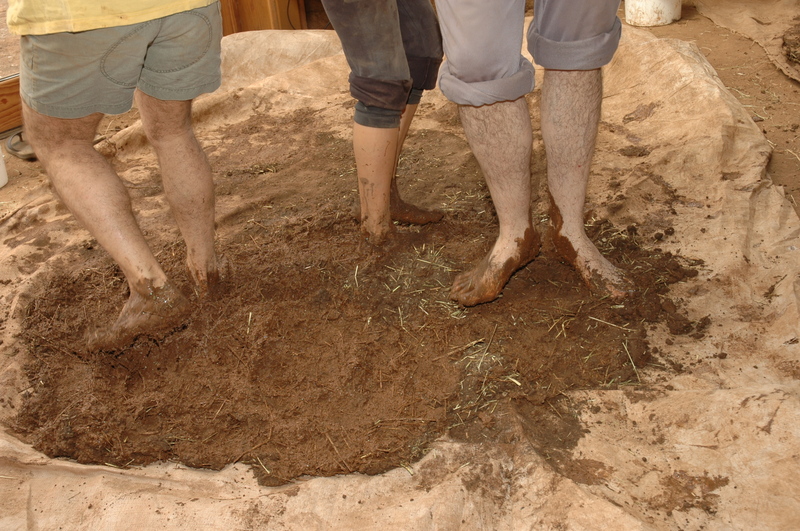 These techniques are therapeutic because they are executed in groups and in a fun and dynamic way, for example, by stomping mud in a circle and listening to music. Figure 1.13 – Images that show the feeling of belonging. 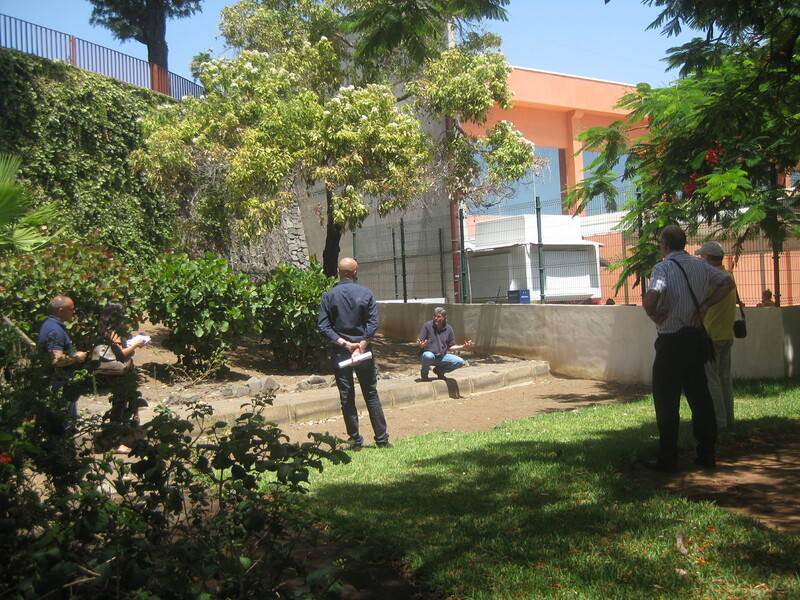 To the left a collage of pictures of different experiences of the CEE workers and to the right an example of CEE worker explaining his experience to the staff of the Santa Cruz de Tenerife Day Center in the edible gardens. Encouraging the formation of groups promotes gender equality, team spirit and working skills with tools (Figure 1.14). The formation of pairs is encouraged as well (its effectiveness among persons with mental illness is proven), developing their self-esteem, confidence, fellowship and communication. 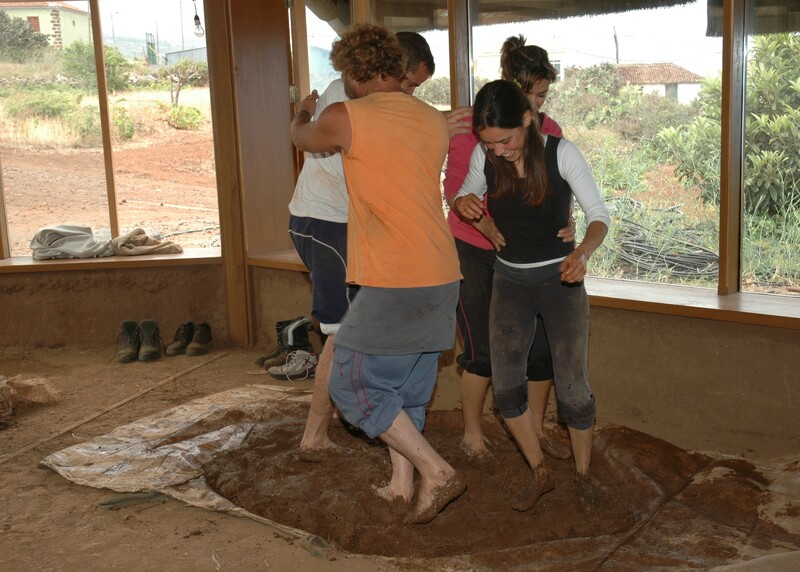 For instance: making a chain with the different students to transport the mud to the place where the wall is being made; forming a big human circle while stomping the mud in a therapeutic way; removing the mature compost from the paths in the edible gardens; whilst harvesting encouraging the most skilled person to teach another person or new students of the group, in order to take turns in the various jobs of the vegetable collection. This involves teamwork in order to take the measurements, to make the calculations and to develop the adequate skills to translate a scheme from paper to reality. Allowing the students to learn how to create a design and how to make it tangible gives them the opportunity to reach a higher level of self-confidence. These techniques are opportunities to develop their intuition, commitment and patience. 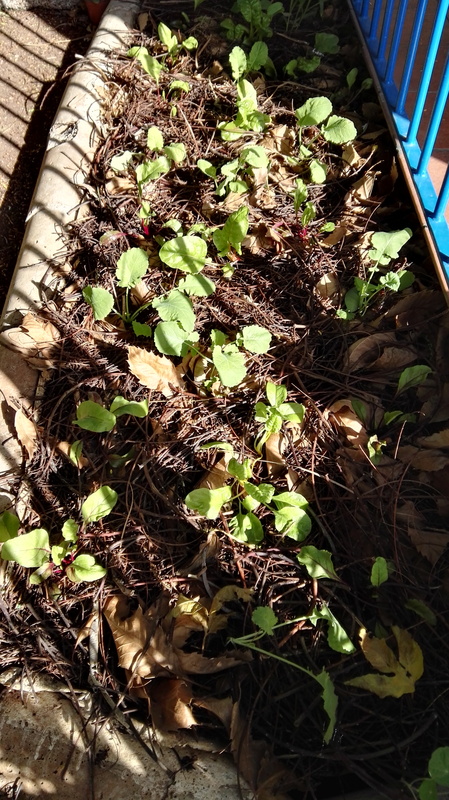 For example, in order to clean the seeds, it is important to focus on the task and to keep the mindset in the present, this way the students develop patience and skills to face very precise and specific chores and it allows us to identify the relationship each person has with certain seeds. Executing chores such as sieving compost to fill the seed trays helps the students to develop mobility skills such as coordination when sieving with another person, a correct breathing and a correct posture. 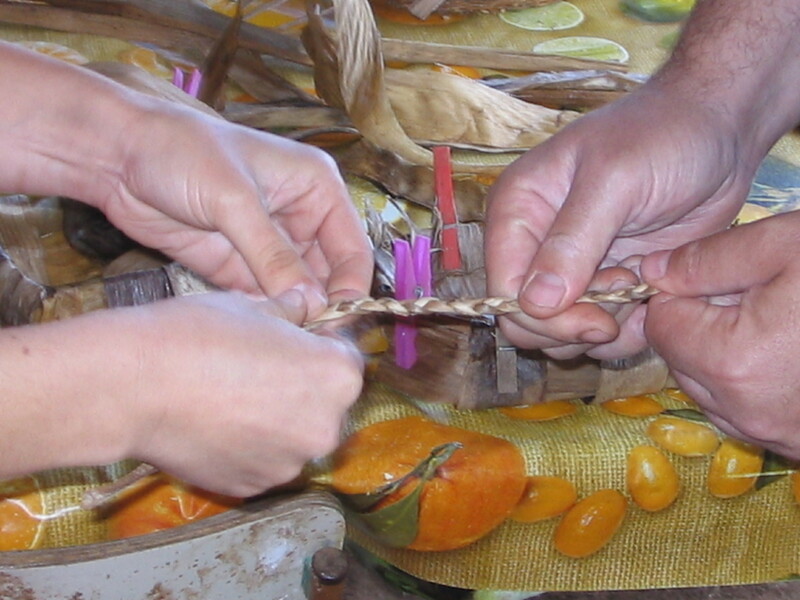 The customized technique of harvesting in the edible garden helps to acquire this kind of skills. They learn to be efficient in their work, to choose the proper tool for the job. They have the opportunity to use tools for small jobs so they can acquire new skills in a fun way. They can help with the building process, which creates a feeling of belonging and helps them feel fulfilled. The permacultural system helps to develop skills such as attention and balance. They work on their concentration in order to achieve a good and correct breathing and attention through a correct posture, always helped by their instructors. 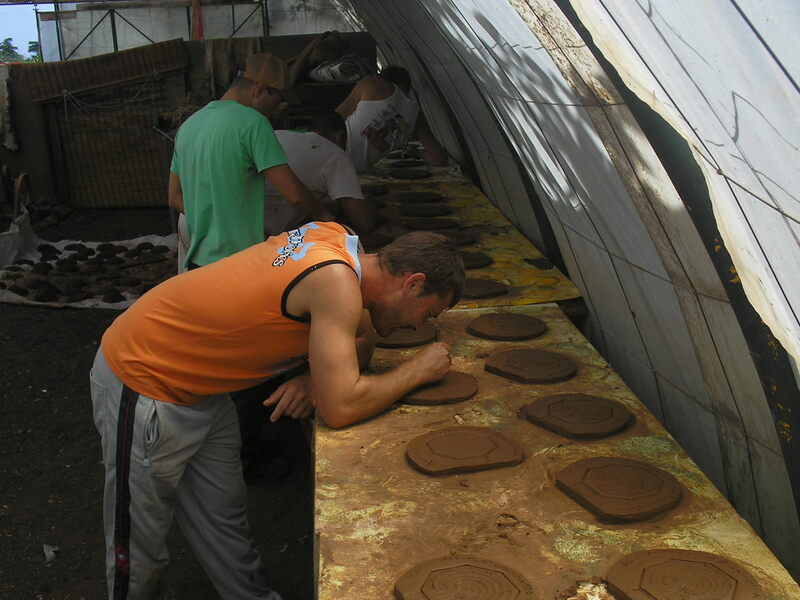 For example: while sowing and planting, putting more effort in concentration and attention through observation; the clay tests to check if it’s suitable for the bioconstruction; with the measurements to realize many other activities. For example: personalizing a field notebook for the edible gardens; designing fact sheets of the properties of the edible flowers and aromatic herbs that are sold in the bioboxes, and that can be decorated by the students with the support of the instructors; in the allotments by creating rainbow-shaped colourful compositions of the plants in the beds or by preparing dishes with raw vegetables that were sown, planted and collected by them in order to develop their “edible creativity” (Figure 1.15). 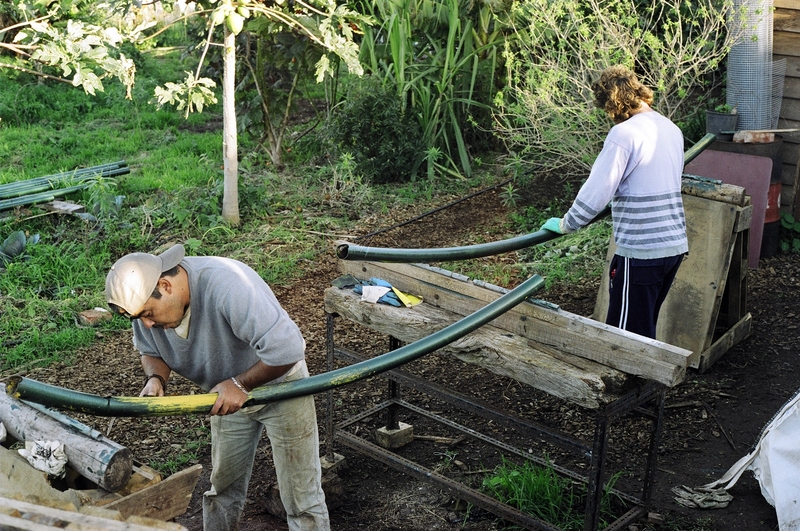 They stimulate social relationships, self-confidence, fellowship, mutual help… For example, instilling awareness about crucial resources such as water and soil; making little excursions in the farm and its surrounding area to collect material for the bioconstruction or to recycle material in order to identify different wastes that can be transformed into resources for our center. One of sources for this guide has been the ADP training dimension in the LASOS project framework described in the Introduction chapter. 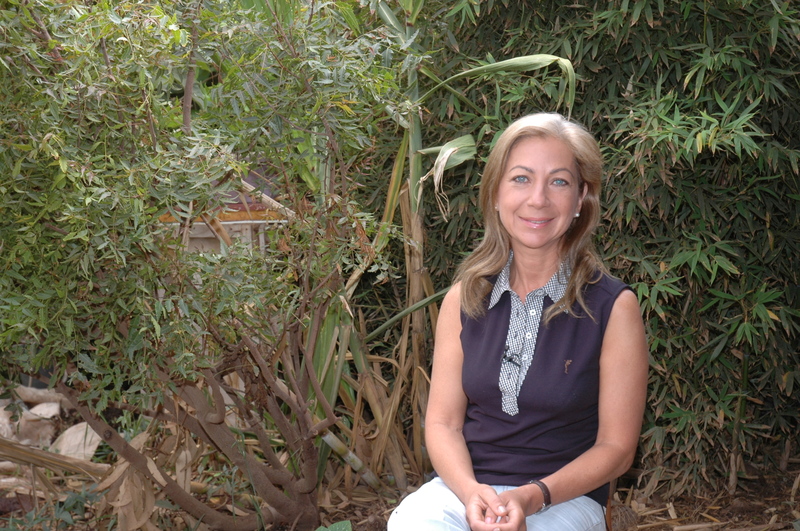 More specifically it is based on the training experience and transfer of knowledge with the IASS through a technical advice, awareness and permacultural design training services during 2015 and 2016 for IASS social centers in Tenerife (center for the elderly, childhood, persons with functional diversity, female victims of gender violence…). 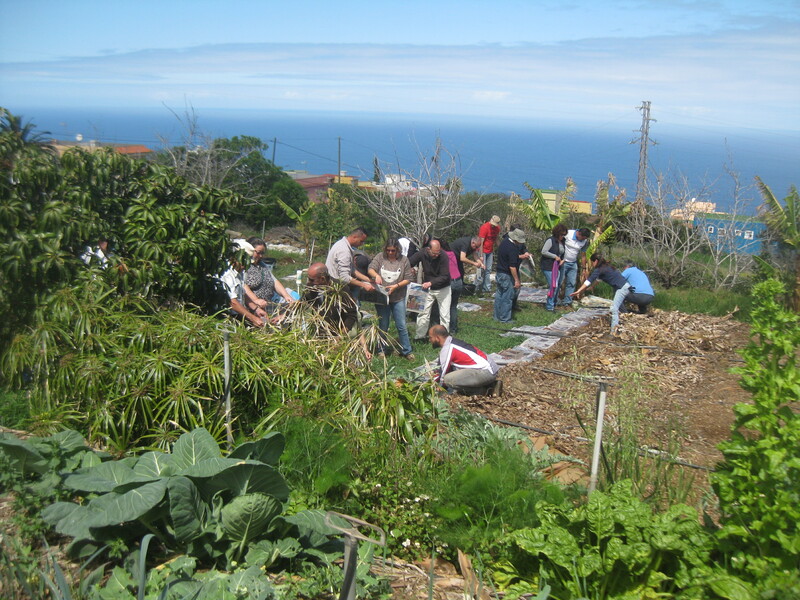 From the beginning of the LASOS project in 2014, IASS had been taking part actively in the specific social objective of the project: integrate permaculture in the Tenerife social centers and benefit of its fields and vegetable gardens as resources for social integration. As a result of this experience of collaboration between social entities of the project such as ADP and IASS, an own IASS project was launched in 2015. 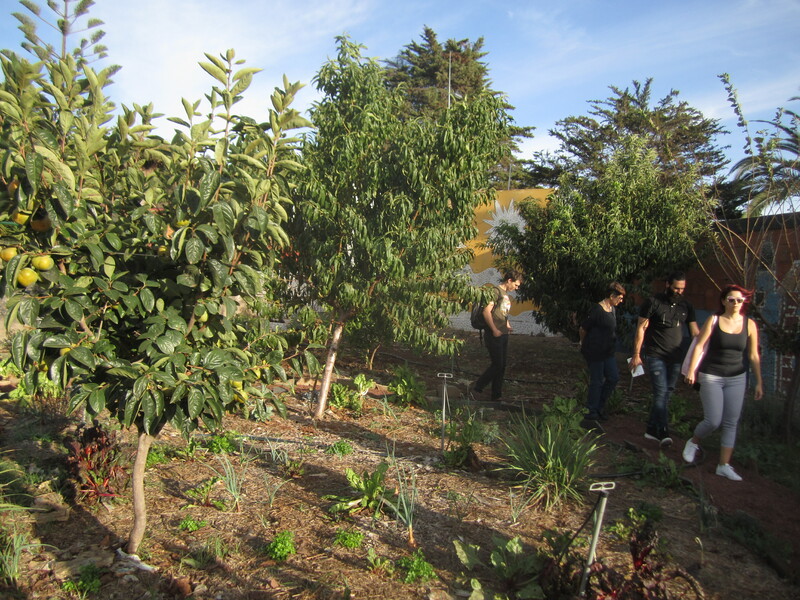 Permaculture is the cornerstone in the educational, therapeutic and social integration activities in its social care and health centers (Figure 1.16). This technical advice service of the ADP for the IASS allows us to identify another interesting exercise of transfer of knowledge and experiences replicability similar to PERMIND objectives. Such a transfer has the objective of visualize the PERMIND guide replicability potential in terms of recent experiences that the developers of the guide have been involved in. – It’s my first training and I loved it. A lot of tracks for feedback and enrichment of our health and social care are included, the care of life in its different ways. -We’re very interested in truly knowing this kind of cultivation. To add it to our own programs and develop it with our users (elderly). We’re very excited to start. A very productive, enjoyable and rewarding experience. Information has been perfect, clear and understandable. I leave with the feeling of being able to design a permacultural vegetable garden with confidence. 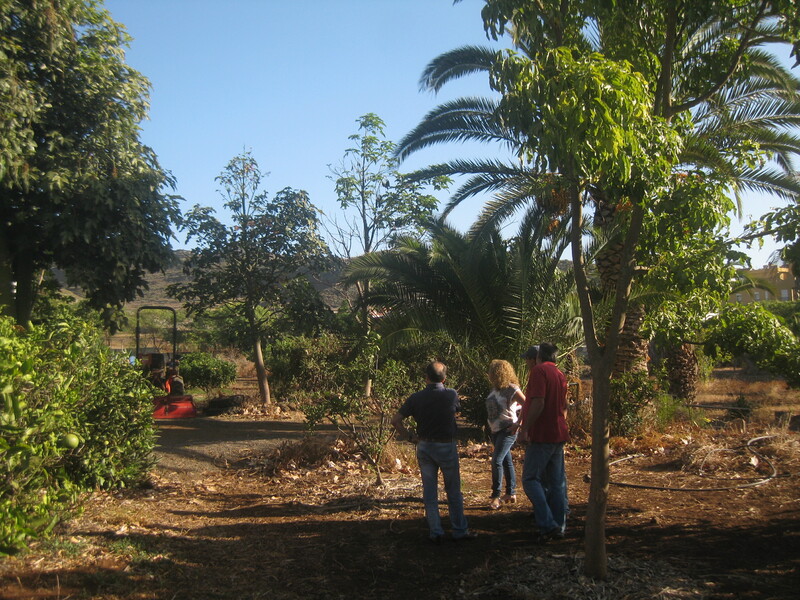 As a result of their first “ground connection” with the permaculture in the farm, there are many reflections of the users from different IASS centers which could serve as a reference of the potential of the PERMIND pilot project co-creation with its own students. These visits were done in the visualization workshops framework developed in the first stage of the LASOS project. 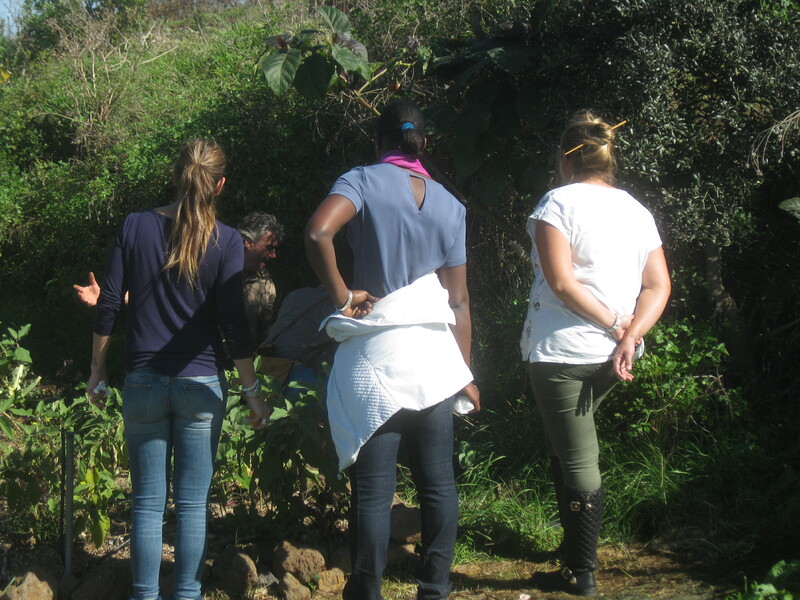 – All in all the instructors responsible of the group considered the visit as very positive, the users of the center had the opportunity to watch closely this different way to perceive, feel and work the crops and the connection with ecosystem. Many thoughts, critical views, curiosity and participation and debate about the possibilities of a similar project in our workspace emerged, along with motivation and initiative for each one’s contribution to collaborate, to collect newspapers and coffee grounds, to get involve and start a new experience similar to the one in our own center. 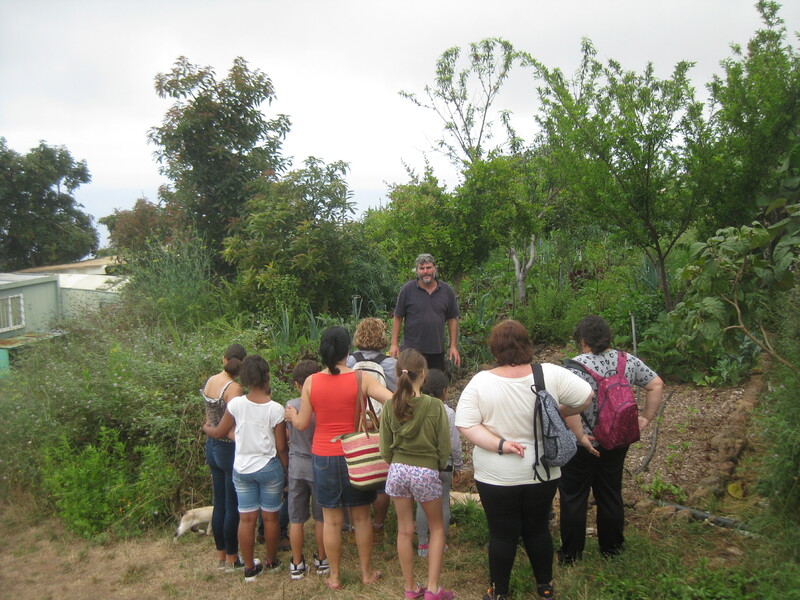 – Permaculture has helped me to understand a kind of education different from what we consider as normal; it’s an education in touch with nature that promotes respect between the Earth and human beings along with other surrounding organisms. Both the experience in the center and the visit to the farm have fulfilled me as a person and have enriched my knowledge to be able to replicate this way of cultivating the soil in any place. I realized that it’s something anyone can do in many locations and by doing so helping Mother Nature, that we’re all part of. I want to thank the amazing team for its wisdom and experience on this topic but overall for helping us to learn. 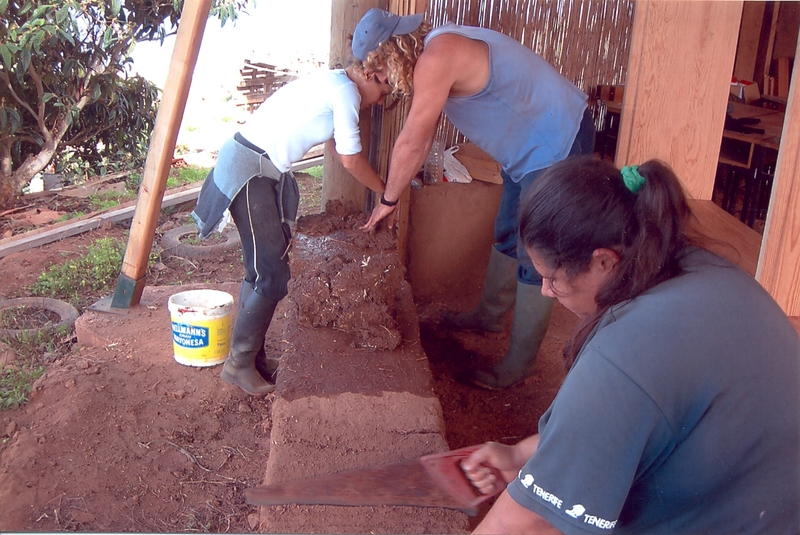 Figure 1.20 – Images of the “ground connection” of the Women Center (IASS) users and staff in the farm and the course and its evolution made possible by the ADP with all of the users and staff of the center. These evaluations may explain why ADP had requested the IASS to participate in the PERMIND project as an associated partner. 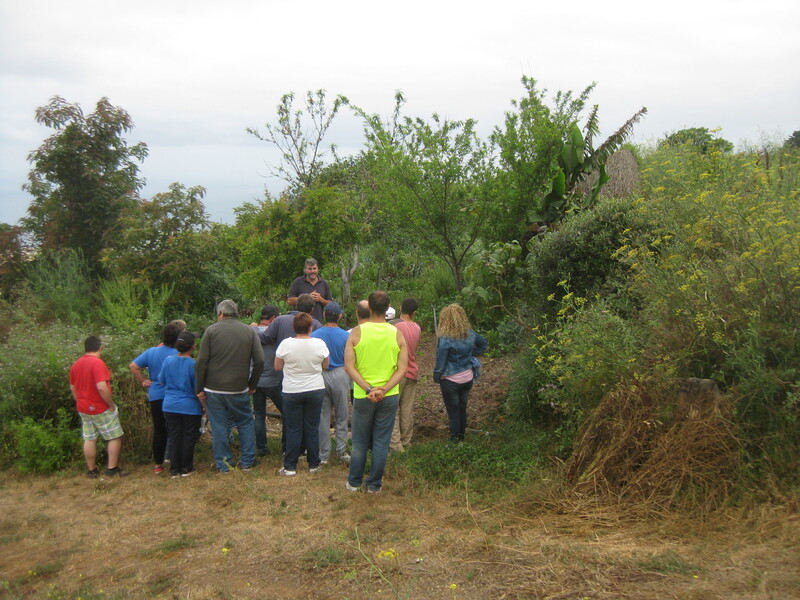 As “non-official” partner, IASS has committed itself to the PERMIND project at institutional level and has promoted this approach based on the use of permaculture as a therapeutic tool, all of it in a beneficial and mutual cooperation exercise. From the very first moment the IASS has fulfilled this commitment. 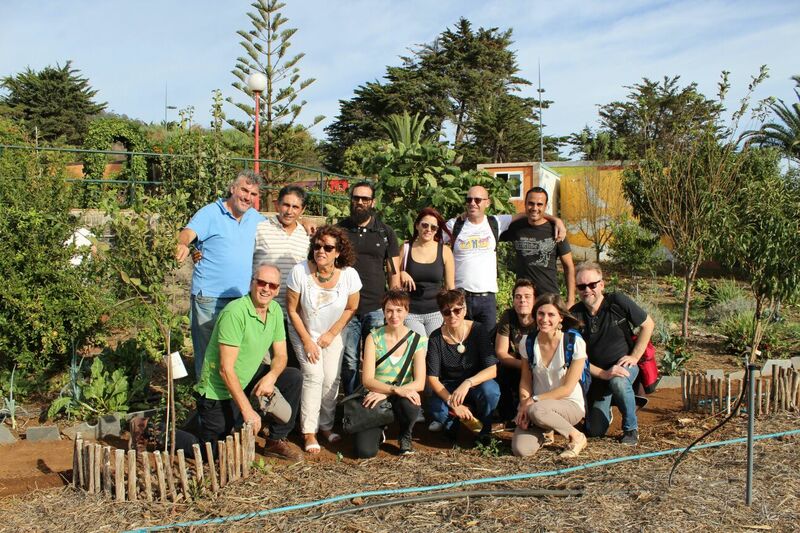 Both in the kick-off meeting of the project in 2017 and in the Training for Trainers PERMIND Course in March 2018, the Occupational Center Los Verodes –an IASS center devoted to work with persons with functional diversity– was visited using the “ground connection” scheme in order to show a successful example of experience transfer of the El Mato Tinto farm, in the same way as the PERMIND pilot experiences (Figure 1.21). We finish the first didactic unit “Permaculture as therapy” with two quotes that show the capacity of the use of permaculture as a therapy and its potential of replicability. Quotes compiled as a result of the different “ground connection” and training exercises in the farm. The first one is a synopsis of the dialogue between two women –Ángela González Belló and Rosario Guimerá Ravina– that took place in the ADP headquarter during the University of La Laguna Transdisciplinar Course on September 6th, 2016. 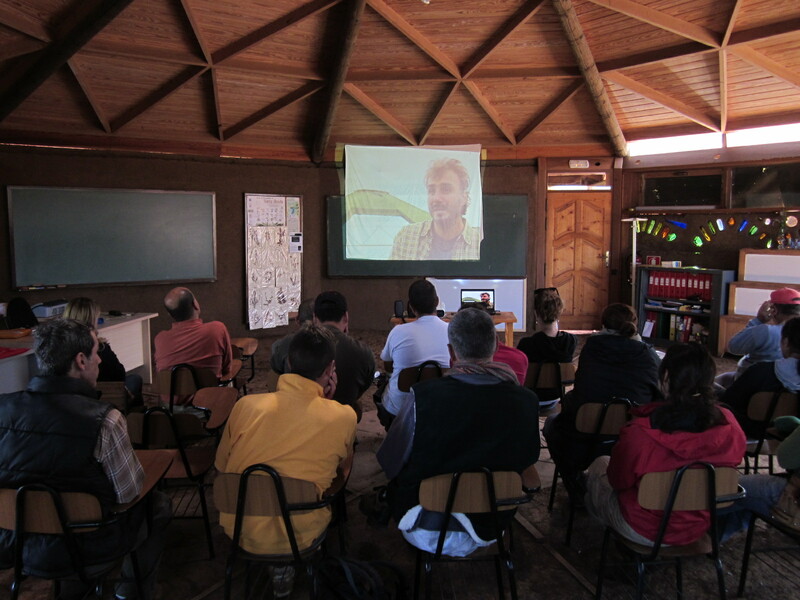 Its title was “Dialogue about knowledge transfer experiences and other examples in the Finca El Mato Tinto”. 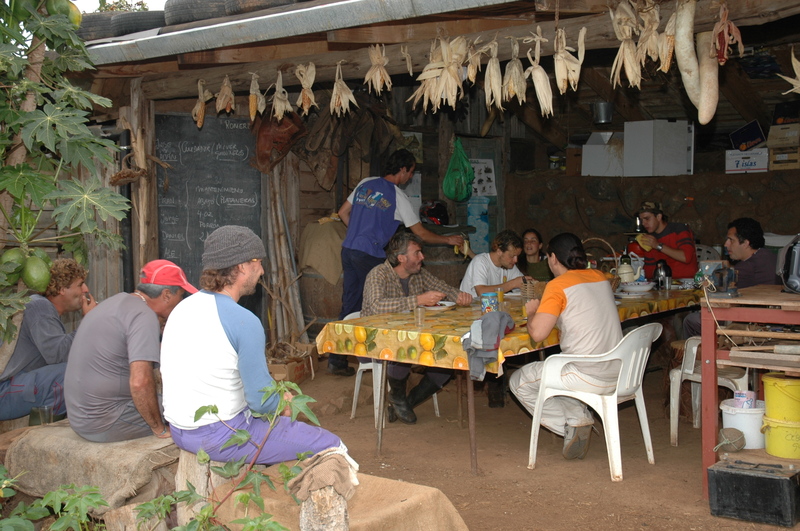 After the experience in the Finca El Mato Tinto, an opportunity to make changes to the employment and/or personal framework is created, and it even manages to transform ways of acting. Out of this, the following proposal arises: The Finca El Mato Tinto –as an inspiring place for different ways to connect us to the Earth and to the people– creates change processes in the ways of acting, and that’s why this dialogue tries to share how a personal and professional “ground connection” can start transforming dynamics in the interrelation spaces. 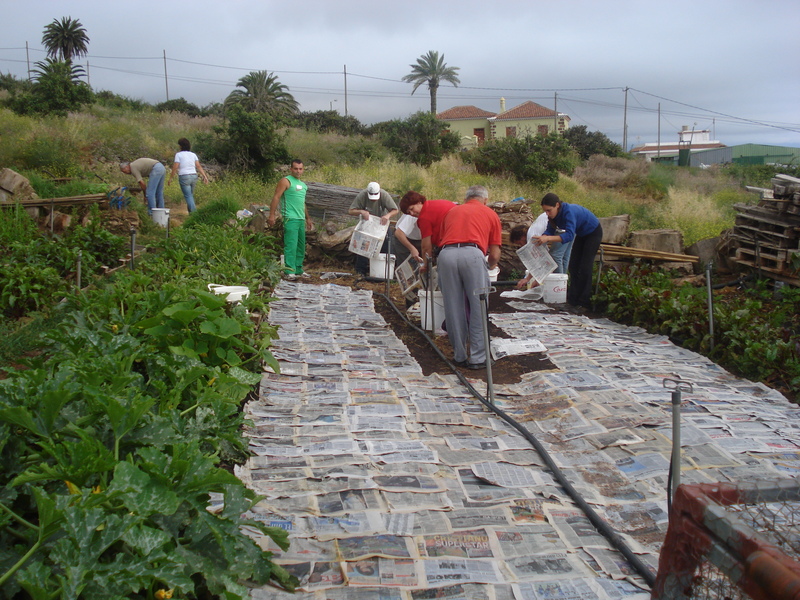 It’s about sharing how the “ground connection” with the farm turned permaculture into an integrated educational and therapeutic tool in different Tenerife’s Social Care Centers devoted to persons with functional diversity, dependent elderly and unprotected children and teenagers; as well as serving as an educational work tool in the school centers and a crucial way of constructing social values during the childhood and adolescence, tempting primary school pupils to work and know about what’s produced in the garden and to enjoy everything the garden gives them. 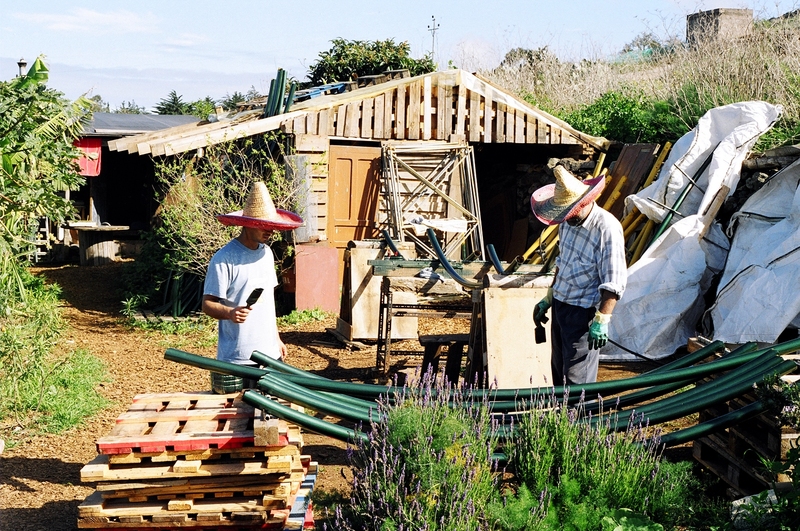 “The experience of having enjoyed learning the good manners and techniques of such skilled people in the permaculture world was really positive. 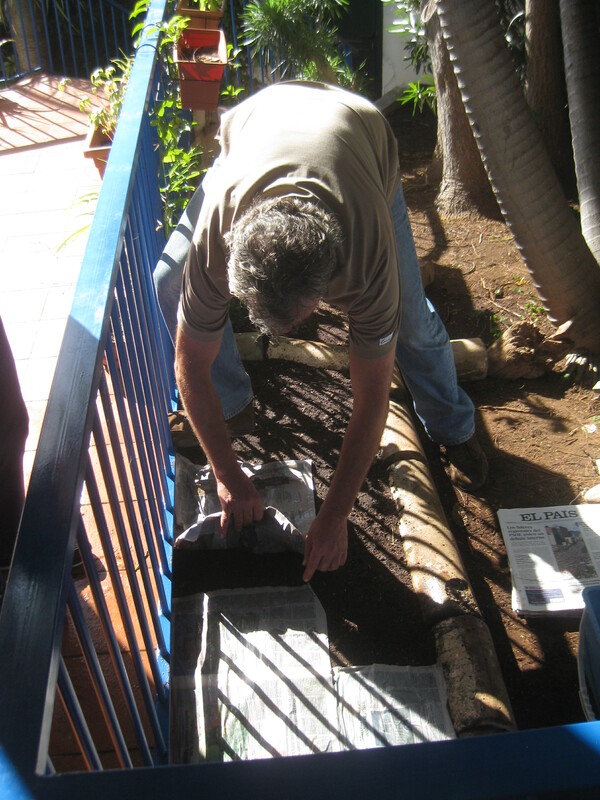 Being able to watch in situ how they prepare the terrain and to get to know the details about how to start and maintain the garden will go a long way in the pilot experience that we’re carrying out in our Center Los Verodes.